We Shaw Love Reading Here! We had a brilliant Book Week. All the children visited our library bus or the local library to spend time learning about how to make book choices and find books of interest for them. Most classes took part in a Bringing Books to Life workshop. On the Thursday we celebrated World Book Day and completed lots of fun activities. It all ended on Friday with a visit from Sue Wickstead, who is a children's author, and we dressed up as pirates! We loved having Sue visit us during book week and enjoyed hearing all about her bus. The children have loved their workshops. Here are some pictures of them in action. If you are not yet a member of the library, you can pick up a joining form from the school office or follow this link to join online. It is an AMAZING resource and we recommend everyone is a member of the local library - it is complete free! The World Book Day website is jam packed with lots of fun ideas, games, videos and activities. On World Book Day you will be given a £1 WBD voucher that you can use to exchange for one of the following WBD books, or use to get £1 off another book. On Friday 8th March we are going to be visited by Sue Wickstead who is a children's author. Some of her books are about a bus that takes on a fun and exciting life - just like our very own school library bus! All the children will get some time with Sue on the day. To find out some more about Sue, visit her website using the link below. Don't forget you can order one of Sue's books to keep as a souvenir of her visit. You can pre-order a book, using the order form sent home (or see below), and on the day of the visit Sue will sign it and you will get to take it home. Friday 8th will also be pirate dress up day. The children will be using the topic of pirates in their English lessons and be reading lots of pirate stories as part of book week and this will end with a dress up day. We are inviting all children and staff to dress as pirates for the day. Remember, you do not need to go out and spend lots of money to take part in this - a simple eye patch and stripy T-shirt would work well. At Shaw we see everyone as a reader and encourage and promote reading for pleasure in our children, their parents and the staff. Remember, every time you read a book at home, write it in your diary and show it to your teacher. Each book you read will count towards you getting a leaf on our reading tree. There is a reading tree in the key stage 1 hall and in the key stage 2 hall and they are both looking very bright and colourful will all the leaves. Keep it up everyone! If you haven't got a leaf yet, we look forward to seeing your leaf on the tree. Friday 16th March the school was transformed into a place full of wonderful book characters as we dressed up to celebrate our love of books. We were also visited by Mat Waugh, a children's author who told us how to write our own stories and showed us that anyone can write a book if they want to. If you want to find out more about Mat and his books, then check out his website using the link below. We would all like to say a BIG thank you to everyone who came to the book fair. It was a great success and we have earned over £240 that we can now use to buy new books for here at school. There are also lots of games and activities on the World Book Day website for you to enjoy. Shaw Primary Academy Library Bus! The Autumn term saw the grand opening of our new school library - the big blue double deck bus! The bus has been transformed from a working bus to a magnificent two storey library jam packed full of books, cushions, rugs and everything else a good library needs. On Friday 8th September all the children had a visit to the library to see it for the first time. Now, every class has a session on the library bus each week to read for pleasure and enjoy books as well as having opportunities to use the library to enhance lessons. For example, using the library bus to research during a topic lesson. The children are very much enjoying using the bus and there are even more ideas to improve the outside area when the weather gets a bit nicer. What an exciting term the Spring was for reading!!! The Spring term was very busy and exciting for reading and books. Take a look at what we all got up to. Once again the book fair was a great success this year and the children will be seeing lots of new books in school from the commission we made. All the children that visited the book fair said it was great and enjoyed having the time to browse and purchase books for their own pleasure. The book fair ran from Tuesday 14th to Monday 20th March and was open after school each day in the infant hall. The book fair was packed with hundreds of the best children’s books for all ages – from award-winners and the newest titles to pocket-money pick-ups and treasured classics. Jack Trelawny visited years 3-6 to give an interactive talk. All the children were nvited to dress up as piratesfor the day as Jack is well known for his pirate stories - everyone looked fantastic! The children were given the opportunity to buy one of Jack's books and those that did got a personal signed copy. If you didn't get one and would like a signed copy, there are letters in the office that will give you details on how you can do this. If you want to find out more about Jack then visit his website using the link below. The children thoroughly enjoyed Book Week and took part in a range of activities that fostered their love of books, which we embrace here at Shaw. All the children took part in a fabulous workshop where a real dance choreographer transported us into the world of Max and The Wild Things from the book Where the Wild Things Are. All the children enjoyed taking part and it was clear to see the children were fully immersed in the story. On World Book Day the children took part in an exciting reading and activity session with another teacher and got to share their favourite books and love of reading. The day ended with The Bumper Book Quiz where the children were able to use their knowledge of books. All the children have been given a £1 World Book Day voucher that they can exchange for 1 of 10 special WBD books at local bookshops. For more information on World Book Day, activities and games, visit the site using the link below. The week ended with a visit from Timothy Knapman who is a well-known children’s author. He worked with all the children sharing his lively and entertaining readings of his amazing stories. Tim spent the day enthusing the children and adults and sharing the captivating fun of storytelling, answering questions and talking about life as an author. We all very much enjoyed Tim’s visit and look forward to hearing some more of his stories in school. If you want to find out more about Tim then check out his website using the link below. Most of the children have visited the local library either during National Storytelling Week or during Book Week. The children learned all about how to choose books at the library and what is available to them. They had time to look around the library and read books of their choosing. Those who are members of the library choose 2 or 3 books that they got to take home and enjoy. Remember, if you are not already a member of the library and would like to be then you can sign up for free. The library is a fabulous place and it doesn't cost anything! You can find the joining form below that you can fill out and take into the library. The children loved National Storytelling Week. There were lots of activities going on with children hearing lots of storytelling as well as telling their own. Some classes also visited the local library and spent time exploring the wonderful books there. The week was good for learning new stories and sharing ones we already knew. We are only into our second term and already our reading trees are looking very colourful and full! Well done to everyone who has a leaf on the tree or is really close to getting one. Remember to do lots of reading at home and let your teacher know about it. When you have read 10 books you will see your green leaf appear on our reading tree. Read 25 and you will get a red leaf, 50 a brown one, 75 a yellow and if you reach 100 books this year you will get to colour your own blossom! I look forward to seeing our trees continue to fill up and I think it wont be too long before we start to see some blossom! Visit the sites below to find out some more about some brilliant authors. Our Year 6 pupils were set a task to practice reading their writing to an audience. 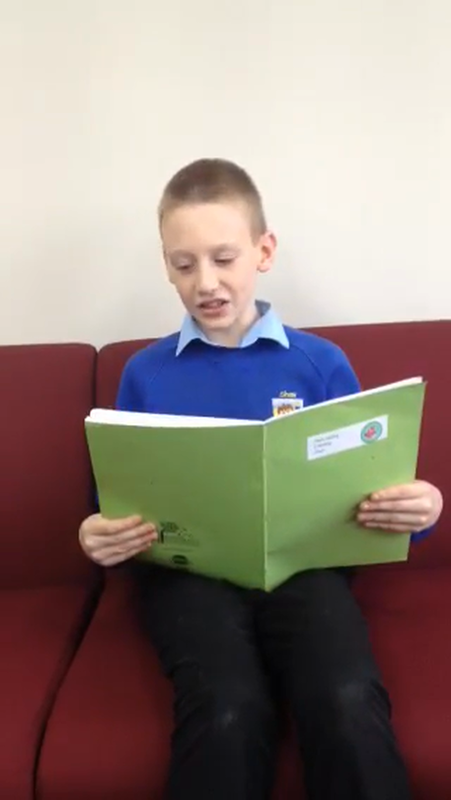 Here is one of our children reading his diary entry. Why not have a read of these books that others have recommended. If you have a great book then tell us about it using the contact box below. Kateshalom has recommended Dork Diaries and Diary of a Wimpy Kid because they both show a day in the life of what they do and what their siblings are like. Room on the Broom - this book is about a witch, magic, love and good. This book I love to read is about a funny dinosaurs. The name of the book is Tyrannosaurus Drip. Written by Julia Donaldson and David Roberts. The Hobbit is the book I am choosing because one of my favourite books is The Lord of the Rings and The Hobbit is related to The Lord of the Rings. It makes me think of how to be very short because hobbit's live in hobbit holes and it is hard for a normal human to live in there.The book is talking about what happened with Bilbo Baggins and Gandalf the grey wizard,it is talking about a great adventure they had an adventure through middle earth. But there is one place you will never want to go in middle earth and that is MORDOR! There is a great evil that roams the land and that is Sauron he created a ring that can take over all the rings of middle earth the one ring that took over all 19 rings. The ring can lead you to your death the ring of death is what I call it.The eye of Sauron watches over Mordor so it is hard to get through Mordor. I like this book because it is a book that you can imagine what is happing. It is interesting and the book is an adventure book. There is also the Hobbiit, Lord of the rings two towers and Lord of the rings the return of the king. When you start reading it you get really interested in it and you can not stop reading it. My favourite character is Sam because he is Frodos friend and he try's to save Frodo even though Frodo left him because of Gollum (Smeagol). Smeagol is a bad guy just because Frodo has the ring he wants to take it back and he calls it his precious he is very weird and evil. They always find a new bad guy on their way to Mordor. My book recommendation is called Dork Diaries how to be a dork and I enjoyed this book because it was fun to read and had so many interesting words that I can use when I am doing my writing that will improve my work. I love books I love to read little adventure books not non fiction but fiction books they are so fun. I have got my reading green leaf on the tree and I'm coming up to the red leaf! Our boys waiting to be collected from school and made the excellent decision to read their books - great choice boys! We would like to know what you favourite book is. Why don't you let us know!